All of us have been through many different experiences in life, some good some bad. Certain experiences can cause you to draw back from who you really are. If you expressed your truest self and it was met with a negative reaction in some way, it can cause you to withdraw that part of you out of sight from the world. If it happens enough times, or is hurtful enough, it can even get closed off from yourself, locked away somewhere deep on the inside of you. Over time, you can just create many different versions of yourself for the purpose of public consumption. Most people when they come to Christ have no idea who they are. Living in a fallen world, with all the hurts, disappointments, disillusionment, and losses takes a toll on the once innocent, believing child they were. Most develop coping skills and defense mechanisms that further complicate the expression of who they really are. Another layer of distortions that gets integrated into a person’s outlook is how society labels them, based on their race, gender, nationality, socio-economic background, and education. All of these can either be limiting or door-opening for a small minority. Those that are in the “99%” are told that there are limits to what they can accomplish. All of these distortions has to be cut through to get to the core of who a person is, and what it is that God has put on the inside of them. The noise of past experiences must be silenced to hear what is down deep in your heart. Jesus came to destroy the works of the enemy (1 John 3:8), and to show us who we really are. God’s not trying to make you into something. He’s wants to expose the real you He already sees. Dr. Monroe said, “You must decide if you are going to rob the world or bless it with the rich, valuable, potent, untapped resources locked away within you.” We are commanded in Genesis 1:28 to be fruitful, and multiply, and replenish the earth. We have a duty to produce fruit from the deposit of potential God has given us. Increase is inherent in the nature of every seed. Our potential in based on our purpose, and our purpose is connected to our passion. What we are passionate about, is a huge clue to discovering our purpose. Passion cannot be manufactured nor chosen. I can’t arbitrarily choose something to be passionate about. I can get interested in something, and maybe even take something up as a hobby or pastime. But a passion is different. It is organic because it is attached to the purpose God deposited on the inside of you when He designed you. To identify your passion, a few questions to ask yourself will help. What is it that makes you come alive? What truly lights the fire within your soul? What could you stay up and talk about all night long? What is it, that when you do it, it energizes you? These are clues and keys to discovering your passion and purpose. Once we get down to the core of who we are, we must DO something about it. Dr. Monroe has stated, “Some dream of worthy accomplishments, while others stay awake and do them.” Potential stays potential until we begin to put one foot in front of the other towards our purpose. It will take work and discipline to steadily move towards what God has designed for us. Thomas Edison said, “Genius is 1 percent inspiratiopotential1n and 99 percent perspiration.” Every person, regardless of their background, who has accomplished great things, has been disciplined at working towards their goal. They can get discouraged at setbacks, but giving up is not an option. Discipline is a major key to be able to accomplish great things. Your destiny is hidden in your daily routine. Broken focus is often a cause of failure. Discipline brings focus. Many people resist discipline and structure. Those that have broken through to do and live their purpose however, have learned this valuable lesson and embraced discipline. They work at being disciplined so that they can steadily, move towards their goal. You will never know what you are capable of until you try. You never know how good you can get at something until you do it the first time, and then a second, and then again. 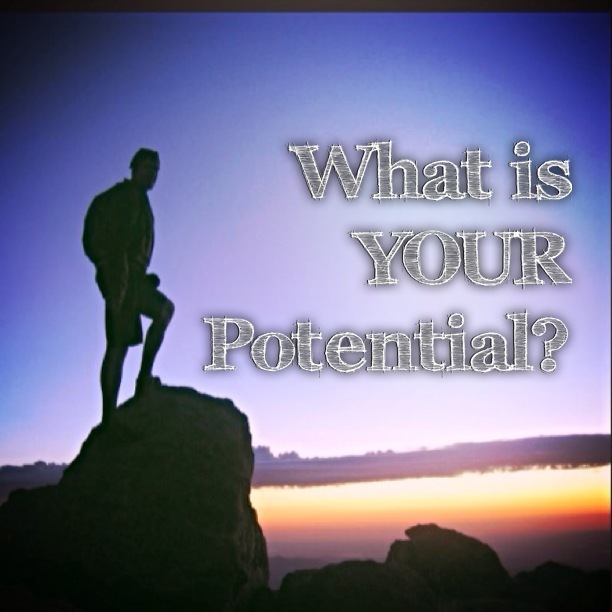 Without a demand on your capacity, your potential will remain untapped. 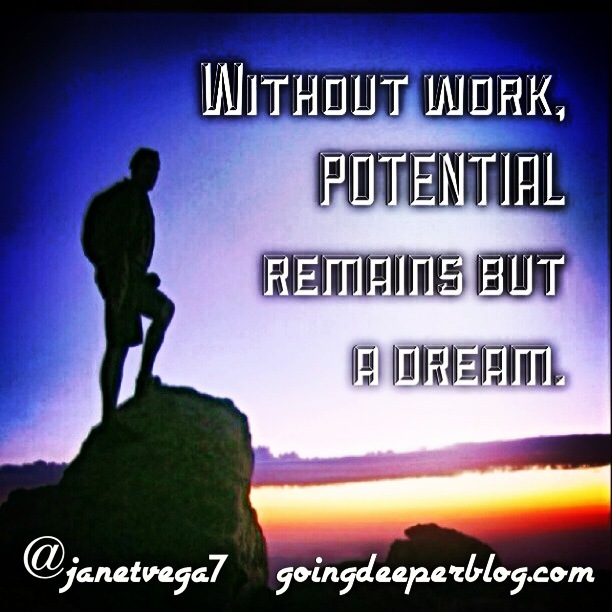 Without work, potential cannot be manifested. Without work, potential remains but a dream. Categories: Bearing Fruit, Faith | Tags: Bearing Fruit, Faith, potential | Permalink.